So, you have been trying out different paint colors for your walls. Those small sampler bottles have been great for eliminating color choices once you paint a swatch on the wall. In fact, by the time you have painted your last swatch and chosen a color, you may have five or six paint samplers sitting around. You do not want to waste them, but what can you do? Try one of the five simple uses for them below and get your money’s worth, even if there is only half of the sample bottle left. The most common use for the sample bottles is to use them for touch-ups. When the wall color has been chosen, save the sample bottle and use it to touch up any nicks or scratches on the walls. It is important to make sure that the sample bottle is exactly the same shade and finish as the wall paint itself. Even if the color is the same, if the wall is done in an eggshell finish and the sample is semi-gloss, there will be a huge difference when you touch up the wall. You do not want to draw attention to the part that has been repainted! 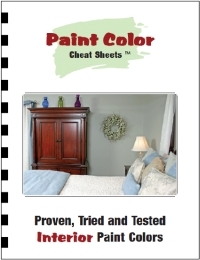 Paint those unfinished wooden accessories with paint samples. There is no use purchasing a gallon of paint to finish a small wooden clock or stool. Instead, use the leftover paint samples to decorate those pieces. You can usually find unfinished wooden pieces at craft stores that are perfect to use with paint samples. Have you ever wanted to paint a mural on your walls? With paint samples on hand, it is the perfect time to start one. Outline the scene in light pencil and use the paint samples to cover the larger areas of the mural. Your scene can be a realistic one or one that is abstract and whimsical. The leftover paint will save you money when you go to paint it. There may be some pieces of wooden furniture in your home that just need a little bit accenting to make them pop. Maybe it is the wooden side table or your child’s bookshelf that could use a face lift. Use the paint samples to create a fun paint scheme on the piece. You can paint each shelf of the bookcase a different color or paint stripes on the legs of side table. It is a great opportunity to accent your pieces at no additional cost. Whatever you choose to do with your paint samples, make good use of them. It is good not only for your budget, but for the environment. Those are some very helpful ideas. I have a shelf full of samplers!